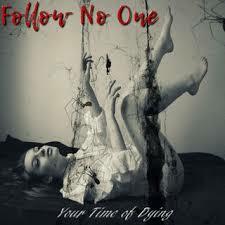 Follow No One has that certain something which connects with contemporary rock, metal and progressive listening enthusiasts. According to the duo, the band’s music presently can be heard on every continent. No wonder. After hearing “Your Time of Dying,” you will likely agree. Guitar driven, melodious vocals help make this track a recommended choice. The thick six-string tone and lyrics only add to a winning formula. Composition and instrumentation are clearly a cut above.